I knew this day would come. Actually, I've been kind of excited dreaming about this day because of the possibilities. Though in all honesty, I wasn't really prepared for it when it happen. What is "it"? A little while back I was traveling in Boise on business. While in a meeting I got a couple calls in a row from Jessi - a clear sign that something was up. When I finished my meeting, I called home to a crying wife. What in the world could be causing such a problem? As the title suggests, it was her computer. For the third time it has failed on her. When she tried to start it up, all she got was the blinking cursor in the upper left hand corner. I've been saying for a while that I'd like to buy a Mac and that I was just waiting for one of our computers to die before I bought one. Normally, I'd suggest she just get the hard drive replaced, but this is the third hard drive for her computer and neither one of us really like the computer anyways. 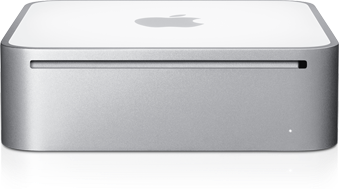 So, after a little bit of research, I think we're going to go with the Mac Mini. It makes sense for us on a couple of levels. First, it gets us into the Mac ecosystem at a cheap price. Second, I already have a laptop from work and my own personal laptop, which means our mobile computing needs are met. Third, I already own a sweet monitor, keyboard and mouse (I got ergonomically aware once I actually had money to invest in it.) Fourth, Jessi doesn't do much heavy duty computing and really wants a computer that just works. Of course, I've also been telling people that if they give me three cool iPhone App ideas, then I'd buy a Mac Mini and help program it. Now that we'll actually own one, that excuse won't really work anymore. I'm pretty sure one of the first things I will do is download the iPhone SDK and create a "hello world!" app.